How to get to Villa Principe Leopoldo? Leave motorway at Lugano South, towards Lago. Turn left at the 1st traffic lights, towards Ponte Tresa. At 2nd traffic lights, turn left and follow hotel signs. 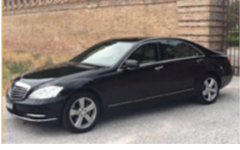 Private transfer service from Milan Malpensa Airport with a private driver in a luxury car, from one up to three people.